That’s why we recommend that pet owners carry a few regular washing supplies in their vehicle. Although nothing will clean your car like a deep car wash and professional detail, you can spot clean on the road to keep things looking great for longer. Grooming Wipes: Animal-friendly grooming wipes look (and function) a lot like baby wipes, in that they allow you to quickly and easily clear away dirt and debris from your pet’s paws, face, and other parts. However, because they’re designed for animals, they’re non-toxic and hypoallergenic. A quick wipe-down after a day at the dog park is great for preventative cleaning. Seat Covers: One quick and easy way to keep your interiors looking great is to protect the seats with pet-friendly covers that can be slipped off and washed separately from the car. Whether you spray them down at the car wash or put them into the laundry, this is an ideal way to increase the longevity and resale value of your vehicle. Rubber Gloves: If space is an issue, keep a pair of rubber gloves in the glovebox or under a seat. (The yellow kind used for washing dishes works best.) Tapping into the power of static electricity, you can put the gloves on and run your hands over the upholstery in one uniform direction. Most of the hair will adhere to the glove, which you can then rinse clean and re-use. Baking Soda or Charcoal Air Cleaner: Pets can be very sensitive to smells, which means cleaning the air with chemicals, scented air fresheners, or even vinegar could upset their little noses. If you need to remove animal smells from the car, an open box of baking soda or crumbled charcoal in a bowl both work well to naturally filter the air. Carrying a small bag of either of these items is great when you want to freshen the air in a pinch. Animal Restraint: Taking your pet to the car wash is perfectly acceptable (and can be fun! ), but safety is always important. That’s why you should always use some kind of pet restraint that will keep your pooch in the car. 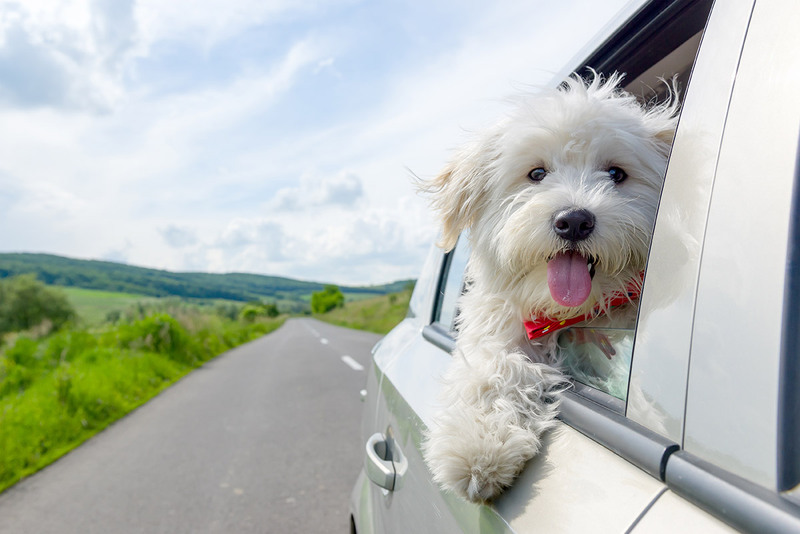 Whether you crate your animal, use an animal harness, put up a safety net for travel, or leash them, choose an option that limits their movement through the car. This will not only be safer, but also keep their hair and messes restricted to one area.